A new procedure designed to deliver stem cells to the heart to repair damaged muscle and arteries in the most minimally invasive way possible has been performed for the first time by Amit Patel, M.D., director of Clinical Regenerative Medicine and Tissue Engineering and an associate professor in the Division of Cardiothoracic Surgery at the University of Utah School of Medicine. Patel started investigating cell and gene-based therapies for the treatment of heart disease 12 years ago, but only recently received FDA approval to try the therapy on Lively, who was the first of several patients anxious to receive the treatment. More than 6 million people are currently living with heart failure. As the condition progresses, patients’ options are usually limited to a heart transplant or assist devices, such as an artificial heart. Patel wanted to find a way to intervene in the progression of heart failure before a patient advanced to the point of needing a heart transplant or device. Patel and his team came up with the idea of retrograde heart therapy, a concept that has been discussed for 50 years. The first successful procedure was performed Nov. 7 on actor Ernie Lively, whose credentials that include a long list of TV and film appearances, including Passenger 57 and The Sisterhood of the Traveling Pants. “It’s incredible. 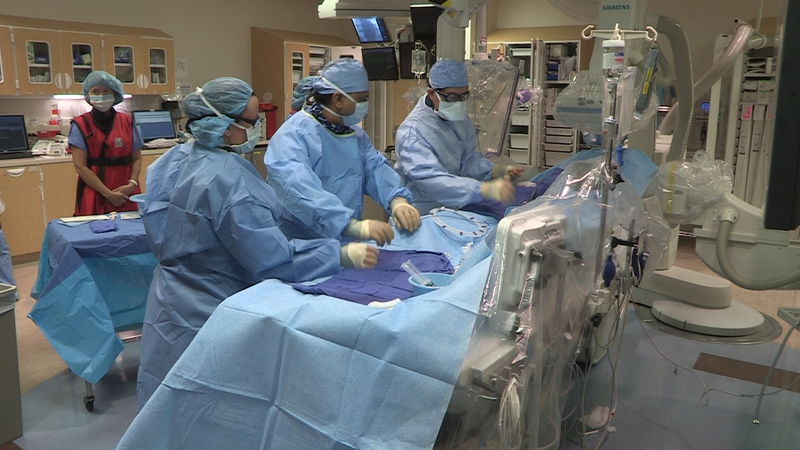 Imagine having a heart procedure that can potentially regenerate or rejuvenate your heart muscle — and it’s done as an outpatient procedure,” said Patel. Patel uses a minimally invasive technique where he goes backwards through a patient’s main cardiac vein, or coronary sinus, and inserts a catheter. He then inflates a balloon in order to block blood flow out of the heart so that a very high dose of gene therapy can be infused directly into the heart. The unique gene therapy doesn’t involve viruses (a rarity for gene therapy, Patel notes) and is pure human DNA infused into patients. The DNA, called SDF-1, is a naturally occurring substance in the body that becomes a homing signal for a patient’s body to use its own stem cells to go to the site of an injury. Once the gene therapy is injected, the genes act as “homing beacons.” When the genes are put into patients with heart failure, they marinate the entire heart and act like a look out, he said. When the signal, or the light from the SDF-1, which is that gene, shows up, the stem cells from not inside your own heart and from those that circulate from your blood and bone marrow all get attracted to the heart which is injured, and they bring reinforcements to make it stronger and pump more efficiently,” said Patel. Patel said watching Lively recover successfully from the surgery is both rewarding and exciting for what the future holds for the procedure and those who may benefit from it. He is already training other physicians around the U.S. to model what he accomplished first this month. He is overseeing a trial of the procedure in which 72 patients will participate over the next few months. “He saved my life,” said Lively.